Do you want to merge media literacy strategies into all K-12 curricula? This practical and usable guide will help teachers and media specialists add critical thinking about media messages to all subject areas. 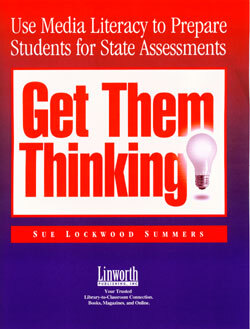 This stand-alone resource has a unique approach to improve state assessment scores (such as CSAP). The United States is the foremost producer of media in the world, and, with this tool, educators can infuse critical thinking and a better understanding about our digital society into the K-12 curriculum. The book is filled with background information, "authentic task" activities, reproducible pages, and includes an appendix listing media literacy resources and organizations. $39.95 includes shipping. Early Youth Education Program. Softbound book, 82 pages with 40 reproducible pages for classroom use. Teachers are welcome to copy the coloring pages from this book for classroom use. This allows for media education of large numbers of children with the purchase of each book. $15 never went so far! Price includes shipping. Early Youth Education Program. Softbound book, 82 pages with 40 reproducible pages for classroom use. $15 includes shipping. The media surround each of us every day with a variety of information and entertainment options. To keep children, teenagers, and even adults from being manipulated by the highly motivated and skillful media makers, adult leaders must teach them to be media literate. The goal of Media Alert! 50 Activities to Create Media-savvy Kids is to install 50 basic concepts by providing easy-to-use ideas for teachers, parents, grandparents, pastors, and youth leaders in general. Successful completion of the learning activities will enable participants to be critical thinkers about the content and format of media messages, their marketing and distribution, and their significant impacts. This book is free. Just pay the $3.99 shipping. Sitcom Sleuths is a board game for all ages that teaches critical thinking about the content of television programs. Using action cards, players traverse an amusing gameboard to win. Play encourages discussion and that leads to learning! $10.00 includes shipping.